It sounds like a something out of a futuristic movie, and yet it’s real and it’s here today. 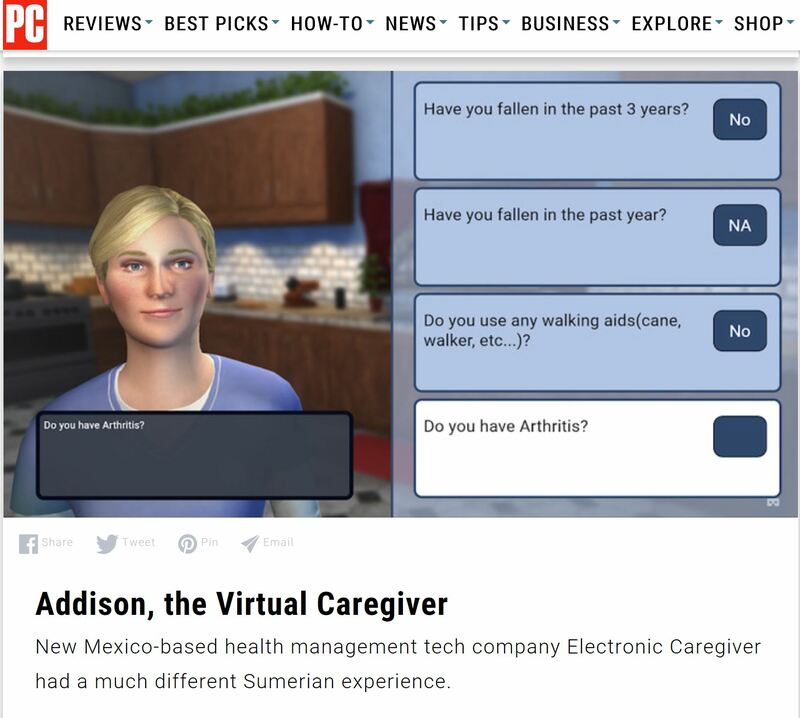 A virtual caregiver, the next level of virtual assistants. She’s more than a tabletop speaker grill. She’s got a face, a body, human gestures, dilating pupils, a compassionate smile, a swag set of scrubs, a dynamic personality, and she shows up at your door with a bag in her hand filled with state-of-the-art health peripherals. Her name is Addison and her advancing communication skills integrate with wireless technology and medical plans of care, giving her the ability to be not only an endearing companion, but a virtual health and wellness partner as well. Addison is designed to monitor, collect, and assess vitals and responses to examination questions, and to identify indications of health stability, improvement, or decline. Addison Care is a combination of conversational speech, animation technology, A.I.-based visual sensing, augmented reality, wireless interactive assistive devices, a cloud-based, proprietary enterprise management platform, and almost too many coordinated technologies to list. Addison Care leverages ambient augmented reality and leading-edge depth cameras to engage clinicians in their practices and patients in their homes. Addison is the brain child of Anthony Dohrmann, CEO of SameDay Security, Inc., known as Electronic Caregiver. Dohrmann and Electronic Caregiver CTO, Bryan J. Chasko, lead an incredible team of over 70 talented developers and dedicated team members. “The goal is to improve the patient experience, to positively engage patients in their personal care plans, to improve communication between providers, families and caregivers, and to expedite a more informed response to the need of the aging and ill. We intend to reduce costly complications, improve health outcomes, and extend lifespans,” said Dohrmann. According to ibisworld market research, the U.S. home health care market has reached $93 billion in 2017, up from $30 billion in 2002, and $65 billion in 2012. There are currently 42 million seniors in the United States, estimated to double to 84 million by 2050. The aging population is not only expanding rapidly, it’s also the costliest population to care for. At age 65 and above, the leading cause of accidental death and traumatic brain injury is falls, costing the health industry over $32 billion per year. Combine these costs as we age with the upswing in declining vision and hearing, hip and knee conditions, cardiovascular disease, respiratory disease, cancers, spinal injuries, diabetes, cognitive disorders, and the resulting impacts to our $3.3 trillion health care system are mind numbing, let alone the growing pressure from shortages of nurses and physicians. Addison Care is seen as a solution and enhancement for the home health care industry segment that’s already saving the system billions by treating and caring for people in-home. Addison Care will help home care operators expand with new solutions to serve a broader range of market needs more efficiently than ever before. The Electronic Caregiver Company (Trademark of SameDay Security, Inc.) is a leading health technology innovator, designing, marketing and monitoring state-of-the-art home monitoring and health management systems for the aging and ill, nationwide. Public outreach efforts by The Electronic Caregiver Company aim to attract seniors towards thinking about the benefits of remaining physically active, mentally stimulated, implementing preventative safety measures. The Company invests heavily to educate the aging, family caregivers and health professionals about fall risks, threats to independent living, and technologies for preventative care. Electronic Caregiver Company is headquartered in Las Cruces, New Mexico, and partnered in gait and balance research, technologies, and virtual and augmented reality technology developments with New Mexico State University (NMSU).